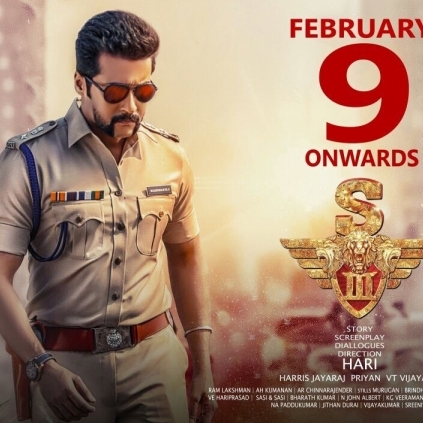 Suriya’s Singam 3 aka Si3 is all set to hit the screens tomorrow, the 9th February. For all those who follow the happenings in Kollywood would be aware that Tamil Rockers, a website that hosts movies illegally had challenged the makers of Si3 that they would be having a live stream of the film on the day of its release. Post this, producer Gnanavel Raja of Studio Green who has bankrolled Si3, had also expressed his thoughts that he would bring Tamil Rockers to books in six months of time, in an audio launch event. Subsequent to this, a writ petition was filed by the producer which sought an order to restrain the Internet Service Providers Association (ISPA) of India from releasing the film online. This was dismissed by the High Court as this was a civil suit and cannot be treated as a writ petition. This is indeed a great move against such malicious websites! People looking for online information on Si3, Singam3, Suriya will find this news story useful.